Although his playing days were not without accomplishment, Brooklyn Dodgers outfielder Len Koenecke is remembered only for his bizarre and violent death late in the 1935 season. While aloft in midnight skies, he was beaten to death by the pilot of the six-passenger airplane that a berserk Koenecke had attempted to commandeer in mid-flight. The fatal blows were administered by means of the craft’s fire extinguisher. At the ensuing coroner’s inquest, what prompted Koenecke’s irrational behavior was explored, but in the end left undetermined. Whatever the demons that possessed Len Koenecke that night, his demise brought to abrupt conclusion a professional career that had looked quite promising just months earlier. The ill-fated Leonard George Koenecke was born on January 18, 1904, in Baraboo, Wisconsin, a rural enclave about 40 miles northwest of the state capital, Madison. He was the middle of three children born to railroad engineer Herman O. Koenecke (1878-1968) and his wife, the former Lydia Steffen (1881-1942).1 Len’s parents were both Wisconsin natives of German Lutheran descent. After local grammar schooling, Len attended the regional high school in nearby Friendship, graduating in 1924. He then began his working life as a fireman for the Chicago & Northwestern Railway, his father’s employer. Stoking locomotive engines and the other labors of his position soon placed an impressive upper torso on the 5-foot-11, 180-pound Koenecke. According to a May 1935 profile of undetermined origin,2 Len played little baseball while in high school. Rather, his start in the game came from an encounter with a friendly railway brakeman, former minor leaguer Murray Boyle. Off-duty, the older Boyle managed the town baseball club in Escanaba, Michigan, a stop on the Chicago & Northwestern line. One day Boyle found himself short of players. Given Len’s muscular physique, Boyle thought he might do as a substitute and induced him to get into uniform, handing him the catcher’s mitt. Although unpolished defensively, the lefty batting/righty throwing Koenecke was a natural hitter and quickly made good with the bat. Taking a leave of absence from his railroad job, Len spent the rest of the summer playing baseball for Escanaba and other local nines.3 At season’s end, he returned to working for the railroad. But the following summer, Koenecke resumed playing ball, joining town and semipro teams in both Michigan and Wisconsin. In 1927 Koenecke began his pro career by signing as a catcher with the Springfield (Illinois) Senators of the Class B Three-I League. In early exhibition play, Len “showed plenty of power at the plate, but [had] a shaky arm and a woeful lack of experience.”4 Released by Springfield, he hooked on with the Moline Plowboys of the Class D Mississippi Valley League, where he was quickly converted into an outfielder. His forte, however, remained hitting. Koenecke feasted on the circuit’s pitching, batting .343 with a league-leading 20 home runs for the fifth-place (63-55) club.5 After spending the offseason again stoking locomotive engines, Len encored in Moline with even better numbers. He led the league in batting average (.389), base hits (182), home runs (22), and total bases (290).6 When the MLV campaign ended, Koenecke ascended to the minor leagues’ highest echelon, joining the Indianapolis Indians of the Double-A American Association. In 17 late-season games, he batted a torrid .394 (28-for-71), with 12 extra-base hits and a .704 slugging percentage, thereby establishing his bona fides as a major-league prospect. Len got off slowly in 1929. Another winter spent stoking locomotive engines had left him muscle-bound and unable to get limber in the early going, a condition that had been a recurring problem for Koenecke. Dispatched by Indianapolis to another Three-I League club, the Quincy (Illinois) Indians, it took him a while to get untracked. But after 110 games, his batting average had reached .325, with 44 extra-base hits. He was then recalled to Indianapolis. There, Len hit .316 in a 32-game stint. During the offseason, Koenecke again returned to his railroad job. He also acquired familial responsibilities, marrying Indiana native Gladys Stoltenberg (1902-1978) in February 1930. The birth of daughter Anna (1932) would complete the family. With his focus now entirely on the diamond, Koenecke enjoyed a superb 1930 season with Indianapolis. On the way to being selected an American Association all-star, he batted .353, with a league-leading 19 triples and 24 home runs. Meanwhile in New York, Giants manager John McGraw was growing restless. Seven seasons removed from his last National League pennant winner and with his club again slipping from contention for league honors, McGraw contemplated roster moves. Like other big leagues skippers, Little Napoleon was keenly aware of the numbers being posted by an Indianapolis outfielder named Koenecke. But Giants scouts were sending back mixed reports on him. One touted the “big, fast” Koenecke as “the pick of outfielders in the minors this year,” while another branded him “a terrible outfielder” who would probably be unable to replicate his gaudy minor-league batting stats against major-league pitching.8 Intrigued but unsure, McGraw decided to inspect the prospect himself, temporarily leaving the Giants and taking the train to Indianapolis in early August. McGraw liked what he saw there. After several games in the Indianapolis grandstands, he offered Indians club owner N.A. Perry $75,000 for Koenecke’s contract rights, a staggering sum in Depression Era dollars. Perry was willing to part with Koenecke but curiously, given the times, wanted players rather than cash in exchange for him.9 Eventually the details were worked out,10 with Koenecke directed to report to the Giants’ West Coast camp in the spring of 1932.11 McGraw’s confidence in him spurred uncharacteristic bravado from the normally modest Midwesterner. “I ought to make good,” Koenecke declared upon reaching Los Angeles in February. “I hit .353 in the American Association and had plenty of triples. None of these cheap home runs for me.”12 He then backed this talk up with heavy hitting in early exhibition games. Shortly thereafter, the Giants traded outfield regular Fred Leach to Boston, opening up the left-field post for Koenecke. Len Koenecke made his major-league debut in the Polo Grounds on April 12, 1932, going 0-for-4 (with a hit-by-pitch) against right-hander Phil Collins in a 13-5 loss to the Philadelphia Phillies. Days later, he went 2-for-5 with a home run off Boston’s Ben Cantwell. But for the most part, his hitting did not meet expectations. And with a substandard .924 fielding average, his work in the outfield remained suspect. In early June Koenecke’s problems were compounded by the unexpected resignation of ailing manager John McGraw. The Giants’ helm was then assumed by first baseman Bill Terry, a non-admirer of Koenecke. His playing time immediately diminished. On June 9 Len went 0-for-4 in a 7-0 loss to St. Louis. Manager Terry thereupon optioned him to the Jersey City Skeeters of the Double-A International League. Koenecke’s bat revived in Jersey City. In 95 games there, he batted .355, with 42 extra-base hits, and earned a late-September recall by the Giants. But again, he did little with the stick upon his return, finishing the year with a powerless .255 batting average, and only 14 RBIs in 42 Giants contests. That offseason, New York severed ties with their $75,000 Lemon, selling his contract to another International League club, the Buffalo Bisons. Minor-league pitching again proved the tonic for Koenecke’s ailing bat. In 1933 Len batted .334, with a robust 59 extra-base hits, and was named to the International League all-star team at season’s end. He also made strides defensively. Koenecke had been handicapped by a relatively late start in the game, but he had the tools – athleticism, foot speed, and an adequate throwing arm – for competent outfield play, and showed it with the Bisons. In 161 games he posted a respectable .980 fielding average. Koenecke’s revived bat and improved defense did not go unnoticed. In late June, the Brooklyn Dodgers purchased his contract from Buffalo, and directed him to report as soon as the International League season ended.13 To Koenecke’s personal detriment, the Buffalo season extended all the way through the Junior World Series, lost to Columbus in eight late-September games. By that time, the Dodgers’ season was completed. Regrettably, his good fortune did not last, and before the 1935 season was completed, both the baseball career and the life of Len Koenecke had reached their ends. Back home in Wisconsin during the offseason, a winter on the local banquet circuit brought Koenecke to Dodgers spring camp overweight. A recurrence of the foot miseries that had plagued him previously then set back his conditioning.17 When the regular season began, Len was unable to reproduce the performance of the previous season, much to the disappointment of manager Stengel. 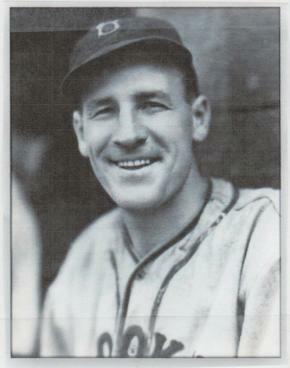 By mid-September, Koenecke’s batting average was well below his 1934 mark, and his power numbers (19 extra-base hits and only 27 RBIs) had fallen drastically. His fielding had also regressed, with eight errors committed in only 86 games of outfield play. Finally, with the Dodgers hopelessly out of the pennant contest, Stengel decided to make some personnel moves. On September 15, 1935, Casey sent Koenecke to the plate as a ninth-inning pinch-hitter against Chicago Cubs right-hander Bill Lee. He grounded out. After the 6-3 loss, the Dodgers headed for St. Louis to begin a series against the Cardinals. Prior to the first game, Stengel informed Koenecke (.283 BA) and pitchers Les Munns (3-7) and Bob Barr (0-0 in two games) that their seasons were over. Their roster spots would be taken by minor-league prospects whom Stengel wanted to see in action. The three were given the paychecks due them and then booked aboard an American Airlines flight back to New York, via Chicago and Detroit.18 Outwardly, Koenecke appeared to take the news philosophically, contacting his wife back at their in-season Brooklyn apartment to advise her that he would be home shortly,19 and showing no visible signs of despondency, at least according to club officials.20 It is uncertain whether Koenecke knew that his tenure with the Dodgers was over for good, as news that his contract had been sold to the Rochester Red Wings of the International League was not widely disclosed.21 In any event, he joined Munns and Barr to start the fateful trip east on the afternoon of September 16, 1935. Although not previously known as a drinker, Koenecke appeared to be under the influence at the airport in St. Louis and boarded the plane with a bottle of whiskey in hand. Nevertheless, the flight to Chicago was uneventful. But problems arose during the hop to Detroit. Mid-route, Koenecke became obnoxious, arguing with fellow passengers and knocking down a stewardess named Eleanor Woodard when she tried to intervene. He then challenged another passenger to a fight, and spent the remainder of the flight under restraint, guarded by the plane’s large co-pilot, R.C. Pickering.22 Upon landing in Detroit, Koenecke was put off the plane by airline officials, with his fare to New York refunded. When last seen by travel mates Munns and Barr, Koenecke was sleeping it off in the airport passenger lounge.23 The two then reboarded the plane to New York without him. In the meantime, the deceased had been returned to Wisconsin. After a funeral service at the Norwegian Lutheran Church in Adams, Len Koenecke was interred in nearby Friendship Cemetery. Survivors included his wife, Gladys; 3-year-old daughter, Anna; his parents, Herman and Lydia Koenecke; and his siblings Herb Koenecke and Janet Koenecke Voboril. Although his career was short, Len Koenecke had been a more than decent major-league ballplayer. In 265 games spread over three seasons, he had posted a fine .297 batting average, with 80 extra-base hits and 114 RBIs. His OBP (.383) and slugging average (.441) were also respectable. And at the time of his death, Koenecke held the National League record for single-season fielding average by an outfielder. Sadly, these accomplishments have been shrouded by the bizarre circumstances of his death, and by the descriptives – surly, troubled, combative – attached to Koenecke decades after the fact by armchair psychoanalysts and ill-informed sports commentators. Little evidence, if any, for such anti-social traits can be found in news accounts published prior to Koenecke’s passing.30 Truth be told, Koenecke’s dangerous and irrational behavior was out of character and inexplicable, but most likely the often unpredictable product of heavy intoxication. Whatever its underlying cause, Koenecke’s conduct brought to an abrupt and untimely end the life of a ballplayer who had begun the season with the promise of great things to come. Sources for the biographical detail provided herein include the Len Koenecke file, with player questionnaire completed by his widow in late 1970, maintained at the Giamatti Research Center, National Baseball Hall of Fame and Museum, Cooperstown, New York; family info posted on Ancestry.com, and certain of the newspaper articles cited below. Particularly informative was the online profile “Len Koenecke: Trains, Planes and Fire Extinguishers,” posted by Gary Joseph Cieradkowski, November 26, 2012, citation below. Unless otherwise noted, stats have been taken from Baseball-Reference and Retrosheet. 1 The other Koenecke children were Herbert (1902-1977) and Janet (1907-1998). 2 The profile is preserved in the Len Koenecke file at the Giamatti Research Center. 3 See Gary Joseph Cieradkowski, “Len Koenecke: Trains, Planes and Fire Extinguishers,” November 26, 2012, p. 2, accessible online at infinitecardset.blogset.com/2012/11/len-koenecke. 4 As later recalled in the Daily Illinois State Journal (Springfield), July 11, 1930. Local sports columnist R.A. Drysdale took an immediate shine to Koenecke when he was in the Springfield spring camp of 1927, and would keep Journal readers apprised of his whereabouts and progress for the remainder of Koenecke’s life. 5 Baseball-Reference has no 1927 stats for Koenecke. The 1927 batting average of .343 was published in the unidentified May 1935 profile stored in the Koenecke file at the Giamatti Research Center, as well as in an article about Koenecke’s death published in the Seattle Daily Times, September 17, 1935. The 20-home-run figure appeared in the Daily Illinois State Journal, November 28, 1927, and The Encyclopedia of Minor League Baseball, Lloyd Johnson and Miles Wolff, eds. (Durham, North Carolina: Baseball America, Inc., 1997), 250. 6 As reported in the Omaha World Herald, December 17, 1928. See also The Encyclopedia of Minor League Baseball, 255. 8 As reported in the Omaha World Herald, December 1, 1931. 9 The Associated Press account of the transaction was widely reported. See, e.g., the Charlotte Observer, New Orleans Times-Picayune, and Tampa Tribune, August 12, 1931. 10 Over time, the Giants surrendered pitchers Joe Heving and Jack Berly, outfielder Harry Rosenberg, and pitcher-outfielder Johnny Cooney to get Koenecke. 11 As reported in the Boston Herald and Springfield (Massachusetts) Republican, August 11, 1931. 12 As quoted in an AP dispatch published in the Baton Rouge State Times Advocate, February 29, 1932. 13 As reported in the Charlotte Observer and Baton Rouge State Times Advocate, June 21, 1933. 14 The Lemon turned Peach was a standard trope for sportswriters writing about the Koenecke transformation. See, e.g., the Brooklyn Eagle, February 19, 1935, and the Richmond Times-Dispatch, March 5, 1935. 15 See “Fielding Mark Set by Koenecke With an Average of .994 in 1934,” New York Times, December 27, 1934. The previous mark of .932 had been held jointly by Lou Duncan of the 1923 Cincinnati Reds and Wally Berger of the 1932 Boston Braves. 16 This demeanor was consistent with the personality traits Koenecke had exhibited previously. Earlier, a Buffalo sportswriter had described him as “not inclined to be talkative and possessing an even temperament that the rawest [umpire] decisions could not ruffle.” See Mickey Rowe, “Len Koenecke: May Furnish Surprise of Year,” Buffalo Courier-Express, March 1, 1934. 17 As per Cieradkowski, p. 4. 18 In 1935 major-league ballclubs did not customarily travel by air. Why Brooklyn brass chose to send the players back to New York by airplane, rather than put them on the train, is unknown. 19 As per the New York Times, September 19, 1935. 20 A stunned Casey Stengel told the press, “I deeply regret [Koenecke’s] death and can’t explain his actions, for when he left yesterday he seemed all right and in good spirits,” as reported in the New York Herald Tribune and Washington Evening Star, September 18, 1935, and elsewhere. Decades later, a Dodgers historian maintained that Stengel had been too distraught to handle press inquiries. Lest Stengel be perceived as indifferent to the tragedy, club officials “persuaded Roscoe McGowen of the New York Times to call the Associated Press, impersonate Stengel’s gravelly voice and issue appropriate expressions of grief. The remarks went out over the wires and no one was the wiser.” Richard Goldstein, 100 Years of Brooklyn Baseball (New York: Dutton Press, 1991), 183. 21 A brief International News Service dispatch revealing the sale of Koenecke to Rochester achieved limited circulation. See, e.g., the San Diego Union, September 18, 1935. 22 As per the New York Times, September 18, 1935. 23 Ibid. See also the (Victoria, British Columbia) Globe and Mail, September 17, 2005. 24 The Stinson had previously been owned by famed torch singer Libby Holman. 25 For more detailed accounts of the incident, see the New York Times, September 17 and 18, 1935. 26 As per the death certificate contained in the Len Koenecke file at the Giamatti Research Center. Modern baseball reference works list the place of death as Toronto, but this is inaccurate. Exactly where Koenecke expired is unknown. But pursuant to standard practice, the death certificate listed the place of death as Etobicoke, the locality where his death was pronounced. In 1998 Etobicoke was incorporated into the city of Toronto. But at the time of Koenecke’s death in 1935, Etobicoke was an independent Canadian municipality, separate and distinct from Toronto. 27 New York Times, September 18, 1935. 28 AP wire dispatch, published in the New York Times, September 20, 1935. 29 As reported in the Boston Herald, New York Times, and Toronto Star, September 20, 1935, and elsewhere. The jury reportedly returned its verdict in 12 minutes. 30 See Cieradkowski, pp. 6-7.